By Ruth Annesley on Tuesday, March 28th, 2017 in Events. 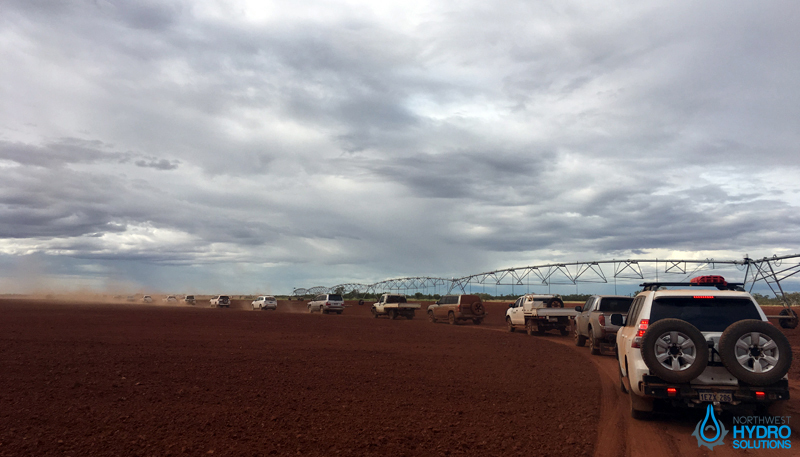 The Northwest Hydro Solutions team recently attended the Kimberley Pilbara Cattlemen’s Association (KPCA) 2017 Ruralco Field day and Conference in Onslow, Western Australia. The conference gathers pastoralists, industry influencers and trade company’s together to share trends and innovative solutions to support members. 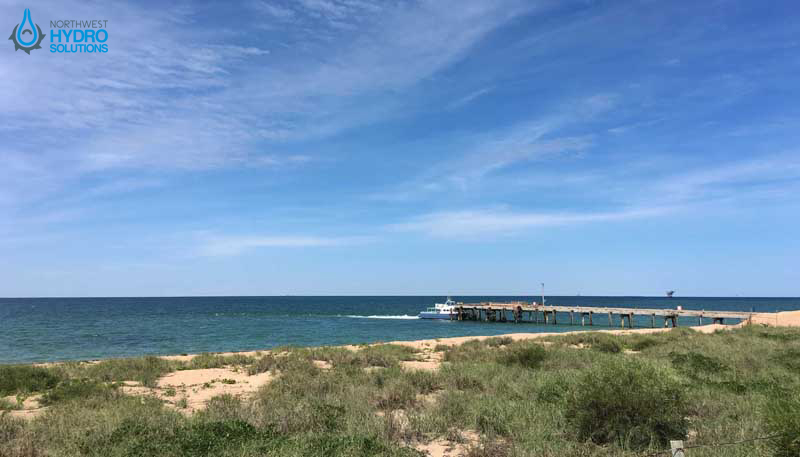 The three-day event included a boat trip to Mackerel Islands, a field day and station tour of Minderoo Station. The first day of the event was a boat trip to Mackerel Island Resort on Thevenard island, hosted by Energy Made Clean (EMC). EMC are a Perth based company specialising in ‘off-the-grid’ power supply. 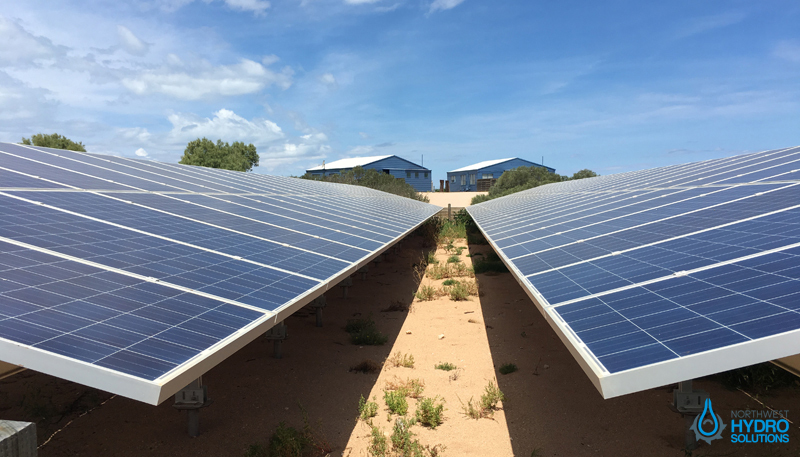 In 2014 their team installed a modular solar system, with battery storage and diesel generator supply allowing the Island to dramatically reduce their power and running costs. EMC kindly took us on a tour of their solar system and battery storage unit and explained in depth the benefits of being able to monitor the facility remotely from their offices in Perth. 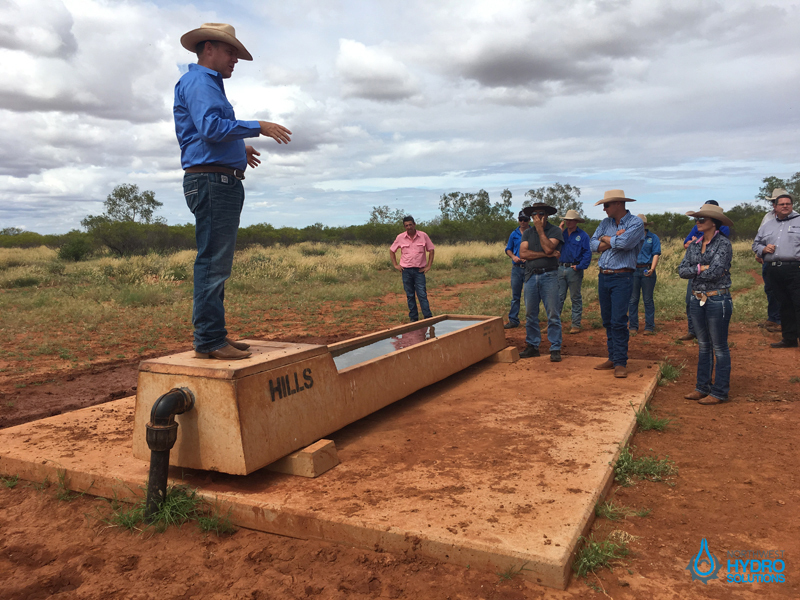 The field day at Minderoo Station started in Uaroo Cattle Yards, at the southern end of the station with a demonstration and talks by Station Manager Ben Wratten on the advancement and benefits of cattle yard technologies. Automation technology implementation has resulted in safer cattle processing ready for sale and allows the producer to ensure cattle are in premium condition before being loaded for transport. 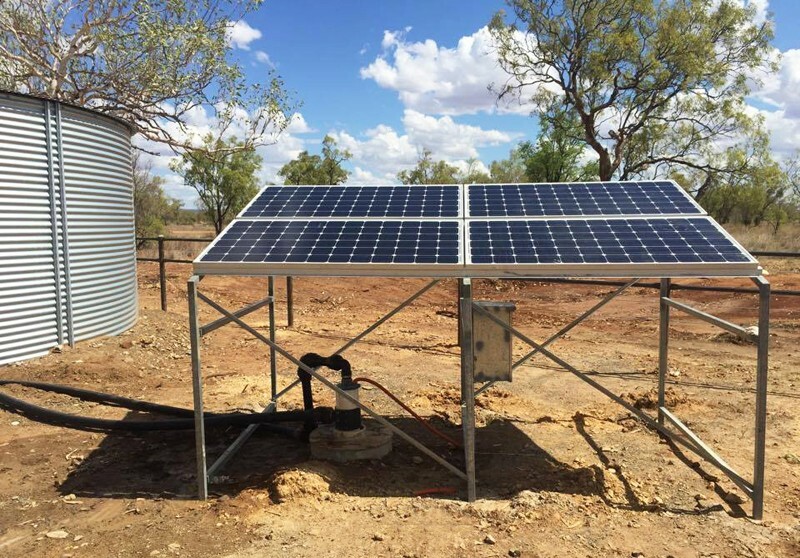 On the way back to Minderoo Homestead for lunch, we stopped by to see some remote solar technology being used to pump water into holding tanks for stock watering. For lunch, we were served a Harvey Beef BBQ under the hangar near the homestead. The break provided great opportunity to meet and greet with other KPCA members, producers, and event attendees. 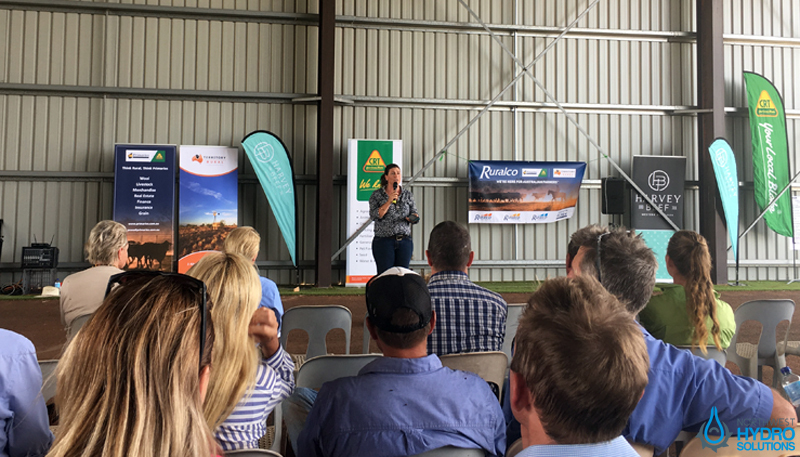 After lunch we were welcomed to Minderoo by Nicola Forrest and listened to a few guest speakers discussing topics such as seed selection for fodder crops, weed invasion and the benefits of drone technology, to name a few. In the afternoon, Ben Wratten led a convoy of vehicles on a tour of the station. We were shown a herd of cattle where Ben spoke about their Ultra-Blacks genetics and breeding program. We then moved on to see their pivot irrigation system in action for growing fodder crops. The tour continued to see other working areas of the station, including a weir constructed in the Ashburton River many years ago, to prevent salt water flowing upstream. This resulted in a better fresh water supply for the station homestead and stock watering. Later in the evening, attendees gathered at Onslow Beach Club for the official opening of the event and welcome drinks sponsored by Watertorque and EMC. The conference was held on the Friday in the recreation center in Onslow and attracted many pastoralists and industry influencers from around the region. 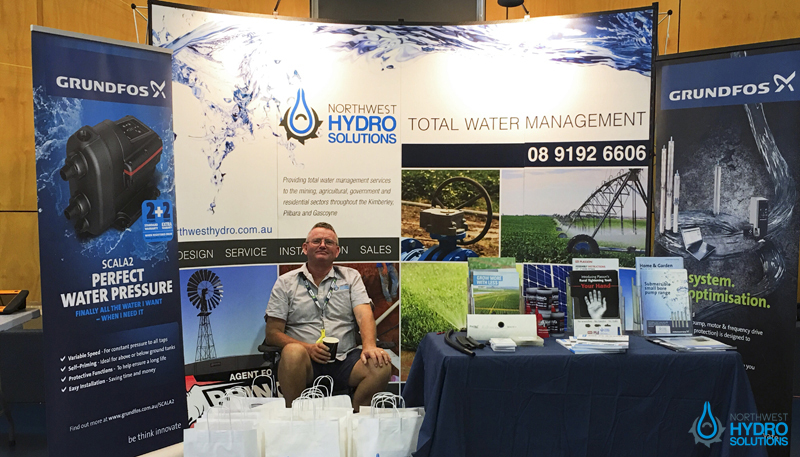 Northwest Hydro Solutions had a trade stall at the event to showcase how we can help pastoralists with their water management needs. 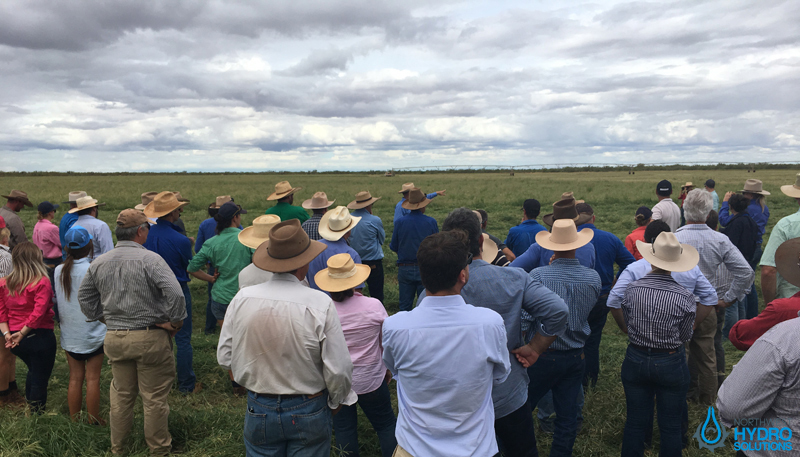 The guest speakers came from throughout the country to discuss and provide innovative ideas for the future and sustainability of the cattle industry. Harvey Beef announced their partnership with KPCA in releasing “Rangeland” beef products onto the market. The new range will be certified with KPCA approved animal welfare standards and using beef from rangeland producers. Later that evening the KPCA 2017 event closed with a Gala dinner and charity auction sponsored by our friends at Landmark. The night’s entertainment was provided by acclaimed Australian bush poet Murray Hartin, who shared with us several poems which captured the essence of quirky characters from the Australian bush. Additional laughs and entertainment was provided by Auctioneer Tiny Holly, who ran the Charity Auction to raise money for the Royal Flying Doctors. An impressive $25,000 was raised and a great night was had by all. Thank you to Catherine Marriot from the KPCA and her team for organising the event and allowing us to be a part of it. We enjoyed the opportunity to get amongst the producers and suppliers of our region and look forward to next year’s event.